Roger Wiens (right), leader of Los Alamos National Laboratory’s ChemCam project, received the honorary title of knight in France’s Academic Order of Palms. 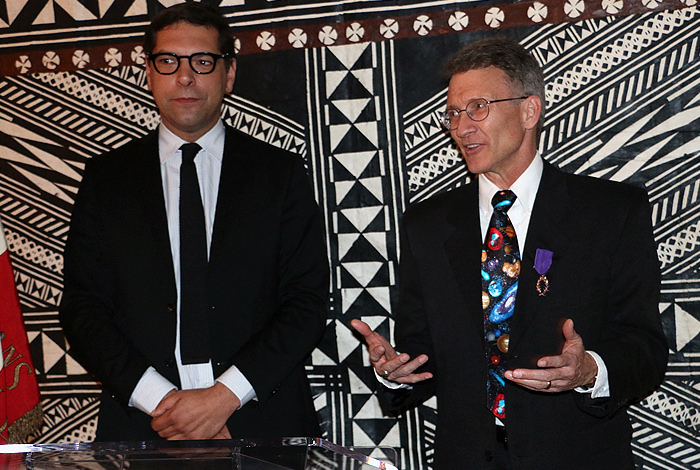 Christophe Lemoine (left), Consul General of France, presented him with the insignia. Credit: Photo courtesy of the Consulate General of France. LOS ALAMOS, N.M., April 11, 2016—Space scientist Roger Wiens was awarded the honorary title of chevalier (knight) in France’s Academic Order of Palms for his work in forging strong ties between the French and American scientific communities. Wiens is the principal investigator of the ChemCam, a laser spectroscopy instrument on NASA’s Mars Curiosity rover that was developed at Los Alamos National Laboratory in collaboration with numerous French scientists. Wiens is now leading a joint effort between Los Alamos and a team at the French space agency, Centre National d’Etudes Spatiales, to develop SuperCam, the next-generation version of the ChemCam device; SuperCam was selected in August 2014 to be part of the new Mars 2020 rover payload. Los Alamos has a long, storied history in space sciences as part of its national security mission and commitment to innovate science and technology. The palmes académiques is the oldest non-military French decoration, established by Napoleon I in 1808. As an American, Wiens is one of only few hundred non-French citizens to be recognized with this distinction. For more information, visit http://www.frenchacademicpalms.org/information.html. The above post is reprinted from materials provided by Los Alamos National Laboratory.